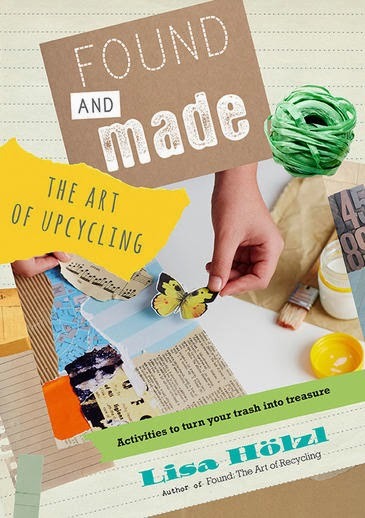 Following on from her 2012 book Found: The Art of Recycling (KBR review), Australian artist and teacher Lisa Hölzl returns with a second book encouraging children to explore the creative possibilities of found and recycled objects. Found and Made: The Art of Upcycling offers children eleven projects to get them started on the path to creating artworks and practical items out of everyday household objects. Each project includes detailed instructions and clear photos illustrating the various steps. Projects include puppet play, a self-portrait with string, creating a storage ‘box of secrets’, and a handmade art book. The book also features information on putting together a home art kit and essential tips for taking care of equipment and maintaining a tidy workspace. Depending on the age of the child, some projects will involve adult supervision to help with scissors, glue guns etc. While Found and Made is certainly a practical art activity book for children, it is also more than that. Hölzl once again connects children’s upcycled and found item art to the work of established artists, which reinforces the message that there can be value and beauty in the things that we discard. The book encourages children to look in their home and local environment for items that can be reused and upcycled into practical and/or beautiful objects to be enjoyed in a new way. Ideal for both school and home, Found and Made is an interesting creative guide that is sure to encourage children to explore their creativity in ways that respect their environment and uncover hidden beauty in everyday items. You can read Lisa Hölzl's guest post discussing her inspiration for Found and Made here.